Some people in Belize speak Spanish or Kriol, but English is the official language and the most commonly spoken. This is because Belize is a former colony of the United Kingdom, while its neighbors were once colonies of Spain. Many people speak two languages. 'Caana', a Mayan pyramid in Belize. More than three hundred and thirty thousand people live in Belize. Kriols make up about 21% of the Belizean people. Three Maya groups now live in the country: the Yucatec, the Mopan, and Kekchi. The Garinagu are a mix of African, Arawak, and Carib ancestry. There are also Mestizos. Belmopan, which is near the centre of the country, is its capital. Other towns and cities include Belize City, Corozal Town, Orange Walk Town and Punta Gorda. Belize is on the coast of the Caribbean Sea. There are about 450 islands. The largest island, Ambergris Caye, is forty kilometres long. Many other islands are very small. In the water around the islands are coral reefs. The temperature along the coast is warm all year round. It typically ranges from 20°C to 32°C. Sometimes hurricanes hit, causing great damage. In 1955 Hurricane Janet leveled the northern town of Corozal. The most recent hurricane to affect Belize directly was the Category 2 Hurricane Richard. It struck land about 20 miles south-southeast of Belize City at on 25 October 2010. On the mainland bananas and sugar cane are grown. Many tourists come to Belize each year. They like to snorkel or dive, to visit pyramids built by the Mayans, or simply to relax on a beach. A beach on Half Moon Caye, one of Belize's many islands. Belize is on the Caribbean coast of northern Central America. 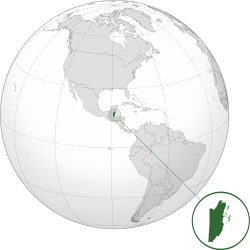 It shares a border on the north with the Mexican state of Quintana Roo, on the west with the Guatemalan department of Petén, and on the south with the Guatemalan department of Izabal. To the east is the Caribbean Sea. The Belize Barrier Reef is along most of the 386 kilometres (240 mi) of predominantly marshy coastline. The area of the country totals 22,960 square kilometres (8,865 sq mi). There are many lagoons along the coasts and in the northern part of the country. This makes the actual land area smaller at 21,400 square kilometres (8,263 sq mi). The Hondo and the Sarstoon River make the northern and southern border. The north of Belize is mostly flat, swampy coastal plains. In some places it is heavily forested. The south has the low mountain range of the Maya Mountains. The highest point in Belize is Doyle's Delight at 1,124 m (3,688 ft). The Caribbean coast is lined with a coral reef and about 450 islets and islands. The islands are locally called cayes (pronounced "keys). Three of only four coral atolls in the Western Hemisphere are off the coast of Belize. Over 60% of Belize's land surface is covered by forest. 20% is covered by cultivated land (agriculture) and human settlements. There are also important mangrove ecosystems across Belize's landscape. The Belize Defence Force (BDF) is the military. It is responsible for protecting Belize. In 1997, the regular army had over 900 people, the reserve army 381, the air wing 45 and the maritime wing 36. This amounts to an overall strength of about 1400. In 2005, the maritime wing became part of the Belizean Coast Guard. In the same year, the government spent $1.2 million on the military. This is 1.87% of the country's gross domestic product (GDP). After Belize became independent in 1981 the United Kingdom kept some military in the country to protect it from invasion by Guatemala. The main British force left in 1994. This was three years after Guatemala said Belize was independent. The United Kingdom still keeps some military people in the country. In 2011 the base was only 10 soldiers due to British budget cuts. They hope to reopen the base later. Belizean cuisine is inspired by British, Mexican and Western Caribbean cooking. The basic ingredients are rice and beans. These are often eaten with chicken, pork, veal, fish or vegetables. Coconut milk and fried plantains are added to the dishes to create a truly tropical taste. Exotic ingredients include armadillo meat, venison, iguana, iguana egg, and fried paca. Conch soup is a traditional dish. It has a characteristic taste and thick consistency due to added okra, potatoes, yams, cassava flour and a touch of toasted habanero. Belizean food is almost always served alongside white rice in coconut milk. The major sports in Belize are football, basketball, volleyball and cycling. There are smaller followings of boat racing, track & field, softball and cricket. Fishing is also popular in areas of Belize. The Cross Country Cycling Classic is one of the most important Belize sports events. This one-day sports event is meant for amateur cyclists but has also gained a worldwide popularity. On Easter day, citizens of Dangriga participate in a yearly fishing tournament. First, second, and third prize are awarded based on a scoring combination of size, species, and number. The tournament is broadcast over local radio stations. Prize money is awarded to the winners. Belize's National Basketball Team is the only National Team to have major victories internationally. The National Flower of Belize is the Black Orchid (Prosthechea cochleata). The National Tree of Belize is the Mahogany Tree (Swietenia macrophylla), one of the magnificent giants of the Belize rain forest. It rises straight and tall to over a hundred feet. In the early months of the year, when the leaves fall and new red-brown growth appears, the tree can be seen from a great distance. The tree puts out a many small whitish flowers. The flowers blossom into dark fruits, which are pear-shaped capsules about six inches long. The mahogany tree matures in 60 to 80 years. The Keel Billed Toucan (Ramphastos sulfuratus) is the National Bird of Belize. It is noted for its great, canoe-shaped bill and its brightly coloured green, blue, red and orange feathers. There are toucans in open areas of the country with large trees. It is mostly black with bright yellow cheeks and chest, red under the tail and a distinctive white patch at the base of the tail. They make a monotonous frog-like croak. Toucans like fruits. They eat by cutting with the serrated edge of their bills. ↑ 1.0 1.1 1.2 1.3 "Belize" (PDF). 2010 Belize Housing and Population Census. Statistical Institute of Belize. Retrieved 7 June 2012. ↑ "Belize Population and Housing Census 2010: Country Report" (PDF). Statistical Institute of Belize. 2013. Archived from the original (PDF) on 27 January 2016. Retrieved 11 December 2014. ↑ 4.0 4.1 4.2 4.3 "Belize". International Monetary Fund. ↑ "2010 Census of Belize Overview". 2011. Retrieved 10 May 2012. ↑ "2010 Census of Belize Detailed Demographics of 2000 and 2010". 2011. Retrieved 10 May 2012. ↑ Cho, Julian (1998). Maya Homeland. University of California Berkeley Geography Department and the Toledo Maya of Southern Belize. Retrieved 4 January 2007. ↑ Daniel Brown/Robbie Berg (25 October 2010). "Hurricane Richard Discussion Seventeen". National Hurricane Center. Retrieved 25 October 2010. ↑ "Move to Belize Guide", Belize Travel Guide Mar, 2012. ↑ "BERDS Topography". Biodiversity.bz. Retrieved 29 August 2010. ↑ Cherrington, E.A., Ek, E., Cho, P., Howell, B.F., Hernandez, B.E., Anderson, E.R., Flores, A.I., Garcia, B.C., Sempris, E., and D.E. Irwin. (2010) “Forest Cover and Deforestation in Belize: 1980–2010.” Water Center for the Humid Tropics of Latin America and the Caribbean. Panama City, Panama. ↑ "Biodiversity in Belize – Ecosystems Map". Biological-diversity.info. 23 August 2005. Retrieved 29 August 2010. ↑ Murray, M.R., Zisman, S.A., Furley, P.A., Munro, D.M., Gibson, J., Ratter, J., Bridgewater, S., Mity, C.D., and C.J. Place (2003). "The Mangroves of Belize: Part 1. Distribution, Composition and Classification". Forest Ecology and Management 174: 265–279. doi:10.1016/S0378-1127(02)00036-1. http://eprints.eriub.org/1053/. ↑ Cherrington, E.A., Hernandez, B.E., Trejos, N.A., Smith, O.A., Anderson, E.R., Flores, A.I., and B.C. Garcia. 2010. "Identification of Threatened and Resilient Mangroves in the Belize Barrier Reef System." Technical report to the World Wildlife Fund. Water Center for the Humid Tropics of Latin America and the Caribbean (CATHALAC) / Regional Visualization & Monitoring System (SERVIR). 28 pp. ↑ "Channel 5 Belize", Belizean Coast Guard hits the high seas 28 November 2005. ↑ Harding, Thomas (15 December 2010). "Jungle training axed as Belize base shuts". The Telegraph. London. Retrieved 12 April 2012. ↑ "National Symbols of Belize" Council on Diplomacy, Washington, D.C. and Consulate General of Belize. Retrieved 5 February 2008. ↑ Percentages add up to more than 100% because respondents were able to identify more than one ethnic origin. "Belize". The World Factbook. Central Intelligence Agency. Retrieved 9 September 2008. This page was last changed on 15 January 2019, at 19:50.